Wanna rub the rat out, skim a few off the top, and catch a little tail? he English founded the United States, the Irish bunged a keg and loosened the national character up a bit, the Africans composed music worth listening to, the Polish brought us a sport to occupy our Thursday evenings, and my Italian brethren established family-friendly organized crime. 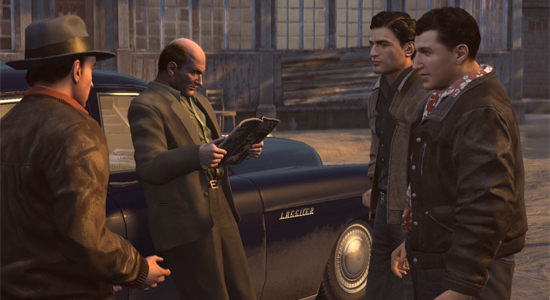 2K Games celebrates this last ethnic contribution with Mafia II, and on Saturday, at PAX East, I was treated to a fifteen-minute demo of mid-twentieth-century, Americo-Latinate depravity. In spite of the trace percentage of Bertolli running through my veins, I haven't the belligerent spirit for learning the finer points of smuggling, racketeering, and various physical or ballistic form of persuasion. That said: fans of Grand Theft Auto and its contemporaries should slip gracefully into the shoes of heroic heavy Vito Scaletta. Even at this early stage, Empire Bay looks and feels authentic.The arc I played was effectively simple: rival toughs took exception to Vito and his pal Joe Barbaro hawking smokes for cheap on their territory, and expressed dissatisfaction by offering a verbal warning and exculpatory opportunity to leave the premises forthwith — including the universal gesture of flinging a Molotov cocktail into the wagon stocked with flammable contraband. What response does that deserve? All together: greasing the greasers. Even at this early stage, Empire Bay looks and feels authentic. Language — poor language, that is — could, on the other hand, use a little more imagination and research. The f-word still shocks, hence its usage, but vintage profanity ought to lend a little more color and authenticity to gameplay. Grit comes in several grades. Although 2K Czech has no reason to compete with dedicated combat engines, gunplay didn't dazzle or impress. The moment bullets started to fly, I had Vito reach for his revolver — when one of 2K's attendants tapped me on the shoulder. "You have a Tommy gun," she said, wide-eyed, using the tone of voice typically reserved by your mother when you, as a child, forgot to say Thank You. I showed appreciation for the advice, yet stuck with the pistol; the attendant was right, as the combat engine made finesse more trouble than it was worth. That's a small quibble. For those eager to rub the rat out, break the joint up, skim a few off the top, and catch a little tail — 2K looks on course to deliver.